Archaeological excavation in the heart of the Old City confirms depiction of ancient map and uncovers ancient road. Video footage. The ancient precursor of the Old City road leading from Jaffa Gate to Mt. Zion has been uncovered -- exactly where a famous ancient Mosaic map says it should be. Part of the map, known as the Madaba Map, is copied in large size at the end of the famous Cardo Street in the Jewish Quarter of the Old City. It depicts 6th-7th century Jerusalem, during the Byzantine period, with the Cardo -- the main thoroughfare beginning at Damascus Gate (shown on the left [north] side of the map) -- as its main feature. However, the road depicted by the upside-down L beneath the Cardo has never been discovered - because no archaeological excavations could take place in an area of such heavy traffic -- until today. Because of the need for a thorough treatment of the infrastructures in the region, the Jerusalem Development Authority initiated a project -- giving the Antiquities Authority a chance to quickly dig down and see what it could find. 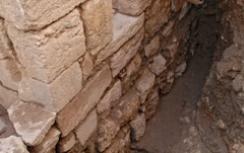 The dig is located just inside the famous Jaffa Gate, essentially in the middle of the street. The ancient road, about 4.5 meters below the current road level, can be seen as basically following the route of the current road leading from the Gate towards Mt. Zion. So surmises Dr. Ofer Sion, excavation director on behalf of the Israel Antiquities Authority. “And indeed, after removing a number of archaeological strata, much to our excitement we discovered the large flagstones that paved the street," Sion said. The flagstones, more than a meter long, were found to be cracked from the burden of centuries. A foundation built of stone has also been unearthed alongside the street on which a sidewalk and a row of columns, which have not yet been revealed, were placed. Artifacts discovered in the excavations include an abundance of pottery vessels and coins, and five small square bronze weights that the shopkeepers used for weighing precious metals.